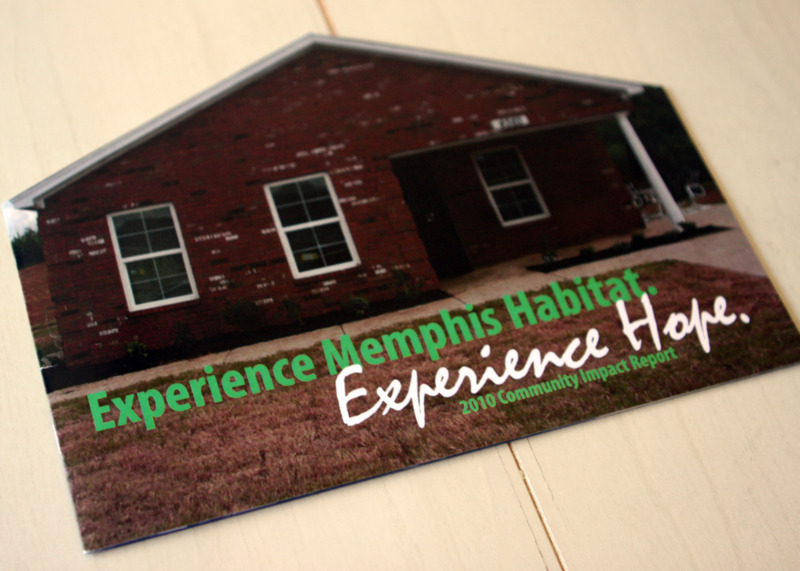 A Habitat for Humanity of Greater Memphis Annual Report I designed during my time with the organization. Characters are the most fundamental element of any good story. In my life and career, I’ve found that the most interesting characters are focused on the world outside of themselves. They give their time and talent freely and/or for very little monetary reward. These individuals operate with a passion that touches all aspects of their lives, and their passion spreads to others. The staff and volunteers who make up the nonprofit world almost always fit the above description. These selfless creative types don’t work for the money. They work because they want to change the world. These people ignite passion in my own work so that it isn’t work at all. In a way, I like to think of myself as one of them, as I have worked for and with nonprofits throughout my career. I also volunteer, and I champion my own personal causes (the biggest being my move to almost full-time veganism in July 2010). I recognize that I’ll never be on the same level as some of my heroes and mentors, but I want to help impact change through my work. Nonprofits have great stories to tell, but staff members tend to be stretched so that they don’t have time for websites, marketing materials, social media and email marketing. I want to ensure every nonprofit has a presence and a voice with their donors, volunteers and the wider community. In my opinion, if a nonprofit doesn’t have a web and social media presence in today’s world, then they don’t exist. Patrons want to be able to learn about the nonprofit in question in a matter of moments, and they need to be able to sign up as a donor or volunteer just as easily. If they can’t tell what a nonprofit does or how to get involved/donate, then they’ll assume the nonprofit isn’t legitimate and they’ll move along to the next one. In addition to websites and social media, keys to the nonprofit branding package include organizational and program logos, branding and print marketing collateral. Having worked for three nonprofits (Lafayette County Literacy Council, Habitat for Humanity of Greater Memphis and Common Table Health Alliance) and with a slew of others during my time at Chandler Ehrlich Advertising, I know nonprofit employees and volunteers don’t have a lot of time to focus on these critical pieces, so they need to work with someone who values their time and who can put together an excellent marketing package quickly and under budget. In 2015 and beyond, I hope to help local and regional nonprofits reach these goals. Gerald & Joan tells stories. I want to tell stories that make a difference. Nonprofits, let me know how I can help tell your stories. Want to work together or just have a marketing question? Contact me -- I'm here to help!